In a typical gallery walk, the teacher displays images (posters, photographs, charts, etc.) related to a topic under study and students walk around the room to comment on them. Depending on the purpose of the gallery walk, teachers can provide students in advance with a conversation guide. 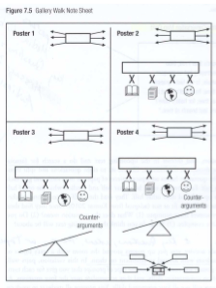 For example, if students have been practicing the 5 core skills of academic conversation (see page 1), students can walk in pairs, sharing a Gallery Walk Synthesis Activity that prompts them to practice specific academic conversation skills at each station and to take notes. If students have been learning viewing strategies (see the Viewing and Media Literacy link at this site) for media images, graphic novels, art, or specialized technical graphics, their conversation can be guided by one of the viewing “bookmarks” at this site.